Streetwise Opera is presenting its latest opera, Tell me the truth about love, at the Sage Gateshead on 14 & 15 April 2018. The opera takes its title from one of Benjamin Britten's cabaret songs, alongside new compositions by Will Todd and Anna Appleby, and arrangements by Iain Farrington of classical, pop and folk tunes mixed into the opera. 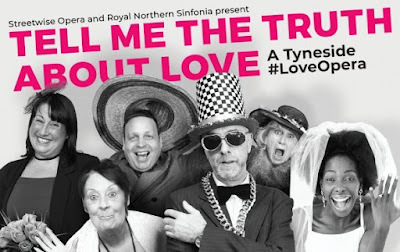 The performance will bring together participants from Streetwise Opera workshops in Newcastle and Gateshead who have experienced homelessness, professional singers including mezzo soprano Anna Huntley, and musicians from Royal Northern Sinfonia conducted by Timothy Burke. The production is directed by Bijan Sheibani, designed by Samal Blak with choreography Polly Bennett. Further details from the Sage Gateshead website.